Paws Hoofs and Claws Inc. (PHC) was formed in 2010 by a small group of dedicated animal lovers in Mount Isa, providing fostered refuge to abandoned, abused, surrendered and orphaned animals. The group was granted Incorporation status in May 2010, and the first executive committee was introduced. This provided the organisation with a more solid foundation for forward planning, as well as a more professional and recognised status throughout the community. Since that time, the organisation has gone through many changes, with a change in executive committee, as well as the introduction of standard operating procedures, providing a more structured and formalised process for animal intake, continuum of veterinary intervention as well as a more effective way of animal tracking throughout our dedicated volunteer foster carers. Paws Hoofs and Claws Inc. is recognised as a Registered Charity with the Australian Taxation Office and the Australian Charities and Not-for-Profits Commission. - and Provide initial and continuum of care to any animal that comes into our care. Paws Hoofs and Claws believe in “euthanasia-free” animal welfare and rescue. We operate under this belief by striving to find suitable homes for all animals that are brought into our care. We also believe that all animals including those abandoned and neglected companion animals have the right to sustenance and healthy lifestyles, but this we provide all our animals in foster care with full veterinary interventions as required as well as regular worming, vaccination and animals of suitable age, desexing prior to adoption. Due to limitations of our services we do at times have the incapability of to accept all animals that require rehoming. We are a non-profit rescue group based in Mount Isa, Queensland. 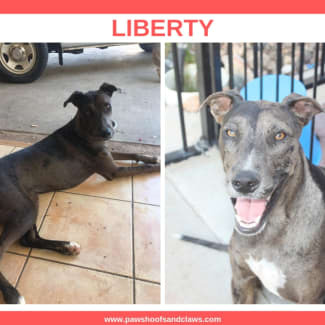 We have adopted out a lot of our animals outside of Mount Isa (Brisbane, Townsville, Cairns, Sydney,, Melbourne etc) so please just ask if we can get an animal to you. 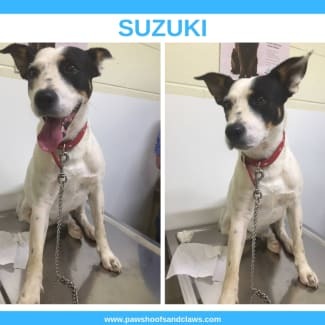 TERRIER X - They Are Big Terriers.... Two white and black outsize terriers were rescued from the pound on Friday... They were both really scared and it was a fight to keep them in the car... They chewed through leads and did everything possible to get out of my car - short of breaking a window.. The boy in particular was shaking like a leaf and, if he could have escaped from my iron grip, he would have done a runner. 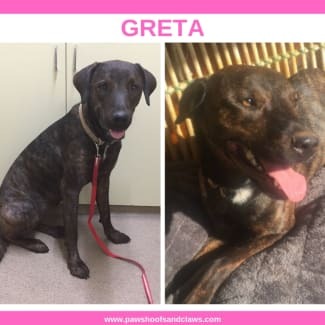 However they seem to have settled heaps already under the loving care of Trista and her family. At least their tails were wagging yesterday as they realised that no harm was going to come to them... The sister is a little more outgoing than her brother but I am sure it won't be long before they are both settled and happy. Suzuki is the boy and he is a solid little tank weighing in at about 16 kilos... Tiptoe is slightly smaller at 13.3 kilos.I have been told that mum is a brindle Staffy X but who knows what dad is??? Puppies Going To Homes Quickly... WHAT ABOUT OLIVER AND SPRUCE?? We are delighted to announce that we are doing really well with our adoptions for our puppies. About two months back, I was very concerned about the large numbers of puppies in our care but now we have only a few left.... Our 10 "E" pups are all pleasing their new owners with their wonderful temperaments. Our five little "Gems" are also delighting their new families.... From our litter of 5 "Popstars", there is just Elvis to go... 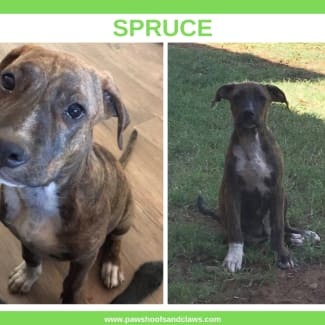 In our litter of 7 with "Tree" names there are only Oliver and Spruce waiting patiently for a forever home. Our litter of 6 "Spicy" cattle pups are down to three - Sesame, Pepper and Fennel. Plus all of our individual puppies have been adopted which is a wonderful outcome to date. Now let's see if we can get the pups which remain some good homes as soon as we can. Oliver and Spruce have grown quickly and are sturdy little fellows with adorable manners and super affectionate personalities... Everyone who has one of their siblings has commented on their great natures and these two are super cuddle pots.....Here are some new photos of the two boys now that they are growing up. CHEVI KICKS HIS HEELS UP.... There is nothing quite like watching a dog having lots of fun.... It is guaranteed to bring a smile to your face and these photos of Chevi having a ball in the water definitely made me smile... Chevi is a goofy teenager of about 6 months but he is simply the best boy.... He listens to you so that he can do his best to please you and he learns quickly . 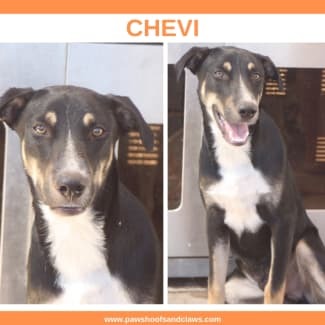 He also watches and follows the lead of the older dogs which he is fostered with if he is not sure of the rules.... Chevi is Mr. Sociable and he loves people and other dogs in equal measure. He is such a happy and easy going boy that most of the dogs he meets like him at once and people adore him. He is also pretty good with our feline friends and will do them no harm. Chevi is growing faster than we expected so I am thinking that he is mostly a Dane which would explain his placid personality. As he grows, he is looking more like a Dane in the face as well. Chevi is a lad who thrives on being a part of the family and will enjoy any activities on offer... especially if they involve water... He doesn't mind a cuddle or three either.